The standard repertoire in jazz is something I’ve resisted engaging with as a performer for some years now. Largely because of the debilitating effects of the example set by Keith Jarrett, but also on account of my own predilection for original composition, I resolved long ago to make my trio a forum for my (our! its!) own creative endeavours. It seemed the best way to make a distinctive statement, and I felt happier playing my tunes anyway. At the very least there was a difference in how I felt; standards did not have the same sense of ownership – dare I say, authenticity. And I have been very fortunate in the company I have kept there, since Dave and Ben are generous and thoughtful interpreters who have never spoken against, much less turned down, anything I’ve presented at rehearsal. My solo performance also has tended towards the spontaneous; although my first solo recording was a fifty/fifty split between original tunes and free pieces, the second was entirely free. I don’t think I’ll ever play a standard tune that says as much about the nature of my musical thought as does ‘So even though’ or ‘Freehand I’. Jazz scholars, particularly non-American ones, talk about a jazz diaspora. This is a curious thought, but the word might be slightly misplaced; although jazz has spread this is not on account of the dissemination of any population. It is indeed the music itself that has spread, but the people who have adopted it bring their own disparate backgrounds to bear on its interpretation. Jazz musicians have been known at times to talk of going back to basics with the investigation of standard repertoire. But whose basics? On May 16 I shall be performing, for the first time, in the Salon at the Melbourne Recital Centre. To say I am excited about this is a rather shameful understatement. The concert is to be a solo recital, just myself and the piano. Except that I have so much work to do, I can’t wait. I’ve done a few of these solo things now, and the two most recent ones – at the South Melbourne Town Hall and at the Wangaratta Jazz Festival – were entirely improvised. When pitching this concert to the MRC I suggested another completely free concert, but said also that if they preferred I could mix it up with some original compositions, or even, at a pinch, play a couple of standards. It is a mystery to me why I said this, except that I expect I was trying to make myself as palatable as possible. I don’t, as I’ve said, play standards in public these days and it would be most unusual if suddenly I did. But do you know what happened? They went for the standards idea. Okay, no worries. But then I thought about it some more. When I was in London over Christmas with my family, we went to Westminster Abbey for choral evensong on December 27, the feast of St John the Evangelist. I have never knowingly celebrated the feast of St John the Evangelist before, and despite my upbringing in the Anglican church it’s taken me this long to find that he is the John who is supposed to have written the fourth gospel. In any case, the canticles were by John Amner, and the versicles and responses by Richard Shephard, and the chant for psalm 97 was by Richard Latham. (It was a really good one, too.) John Rutter’s arrangement of the Wexford Carol was the anthem, and it was all most affecting. Even the Rutter. But at the end, there was a congregational hymn; words I’d not known before (concerning St John the Evangelist: ‘We sing of that disciple, beloved of the Lord, who, telling all he witnessed, proclaimed the Father’s Word’ (etc.)). The tune was Ralph Vaughan Williams’s ‘King’s Lynn’. Actually that doesn’t really flow, because the interview (and my hearing it) predated the trip to Westminster Abbey. But either way, to hear ‘King’s Lynn’ in Westminster Abbey, and to be roaring it out even to unfamiliar words, was very powerful, and some time later I put two and two together, as you do, and thought I might go somewhere with it. 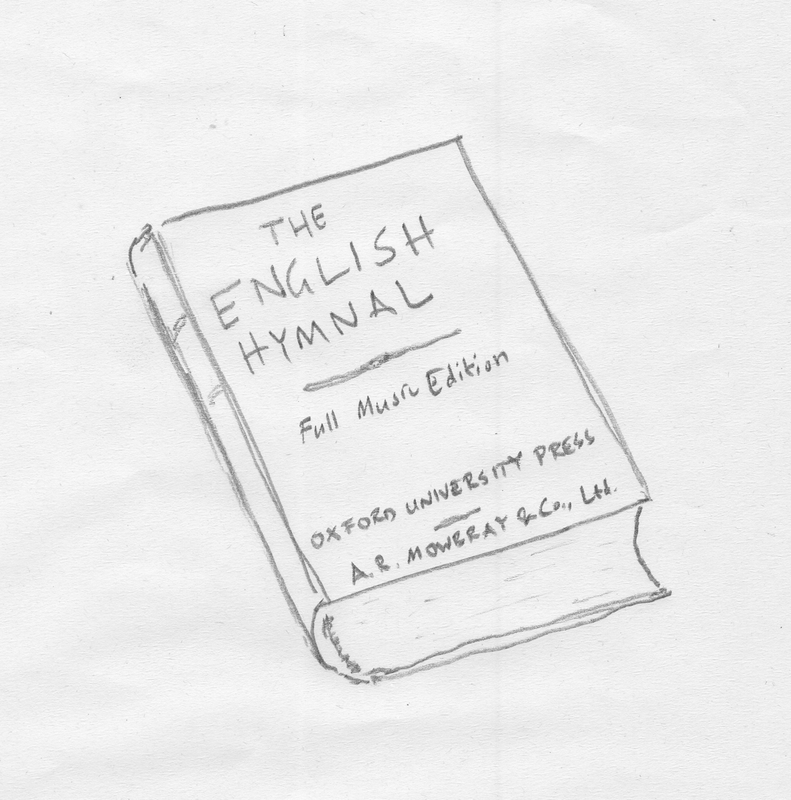 So I wrote back to the MRC: no worries about the standards, but don’t be too surprised if they come from the English Hymnal rather than the Real Book. Then a couple of days later I was running, and it struck me just how much sacred music is fixed in my mind and ears from the earliest years of my musical awareness, and how I might demonstrate its influential and continuing effect on my thinking. And so that’s what I’m planning to do. It seems to me that this concert will probably be the most personal playing I have ever done since I am in a way accounting for elements in my musical language to which I have not yet paid sufficiently close attention. Anyone who had taken an interest in my playing or composition up until now might have something revealed, in a way. I feel that the early things that set the tone, or give one bearings, constitute a different and indeed a very personal variety of standard repertoire, and that’s what I’ll be exploring in the Salon in May.